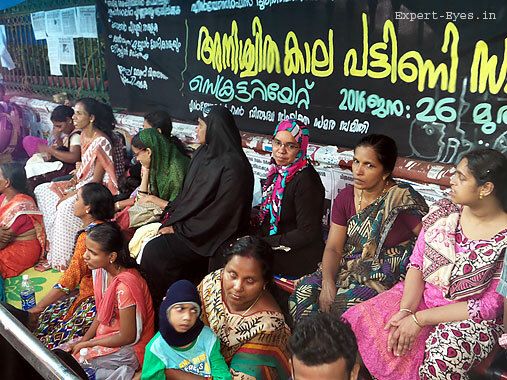 The hunger strike by endosulfan victims and mothers before Kerala Secretariat ended last week after the Government conceded most of their demands. However, the demands conceded were the ones that the government had conceded as back as in January 2014 following their dharna before the Chief Minister’s residence. Implementation was lagging and the victims had to launch another stir to get yet another assurance that they would be implemented. The only concrete gain from the agitation was a specific decision to include about 600 more persons from Kasaragod district under the government’s list for providing compensation. Whether other promises would be kept within the term of the present government is to be seen. In fact, the approach of successive government to the endosulfan problem had been far from satisfactory. It is more than five years since the National Human Rights Commission recommended compensation and other measures. Still the compensation has not reached all. Though it was a problem that should have been addressed on a war footing, governments often chose to ignore the problem. It was convenient for them to do so, because the State-owned Plantation Corporation of Kerala was responsible for aerial spraying of endosulfan. None of the officials who were responsible for using such dangerous methods of application of pesticides in a populated area, and that too in excess quantities and over water bodies, were never held accountable. As to rehabilitative and remediative measures, the government could not even do what the voluntary agencies could. It is notable that even the BUDS schools set up by the government did not have facilities for use by physically challenged persons. Even western closets were absent. As the water bodies were contaminated, the government took no steps to supply pure drinking water to the affected area for two decades after the problem became known. When Rajiv Gandhi drinking water mission was implemented in kasaragod district, the villages chosen for the project were not the endosulfan affected. Decontamination was never attempted. In fact, the remaining stocks of endosulfan with the Corporation are yet to be removed safety from the area. This blog has said that the settlement two years ago was aimed at fooling the victims. This time also, the situation is only marginally better. This entry was posted in agriculture, Environment, health, India, Kerala, politics, Water and tagged endosulfan, endosulfan v by Roy Mathew. Bookmark the permalink.